Through its Let’s Talk Housing (www.letstalkhousing.ca) consultation, the Government of Canada gathered people’s thoughts and ideas on the development of a national vision for housing and a national housing strategy. A successful consultation process should include people with diverse housing needs as their participation would strengthen its outcome. However, for a variety of reasons, many people did not participate in this process. To reduce barriers to participation and support local community conversations that engage people who would be directly impacted by this strategy, Maytree, in partnership with United Way Centraide-Canada and the Lived Experience Advisory Council, developed a community discussion guide. 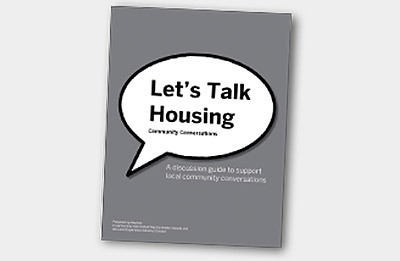 Contribute to a Canada-wide “What Was Heard” document compiling the input gathered from these local conversations; Maytree will put together this document and submit it to the government’s Let’s Talk Housing consultation. While the consultation process has ended, you may still find the guide useful in setting up future community conversations. Download the English version of the discussion guide. Download the French version of the discussion guide. A discussion guide to support local community conversations.